Copper is amazing. One of the reasons I love it so much is how much it changes over time. As it is exposed to the elements, it oxidizes, creating a blue-green patina on it’s surface. Not everyone wants that though, and bright shiny copper is lovely in its own right. 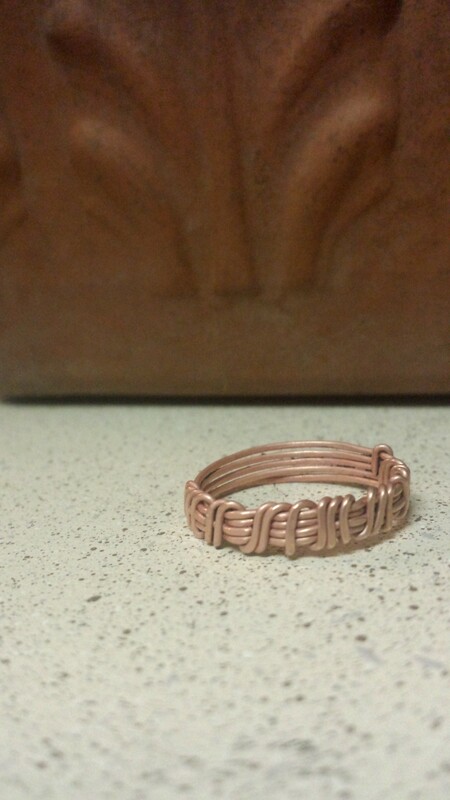 Patina and accumulated dirt and grime can be easily removed from copper jewelry with a few natural ingredients. All you need is some lemon juice, salt, and a small bowl to mix them in. 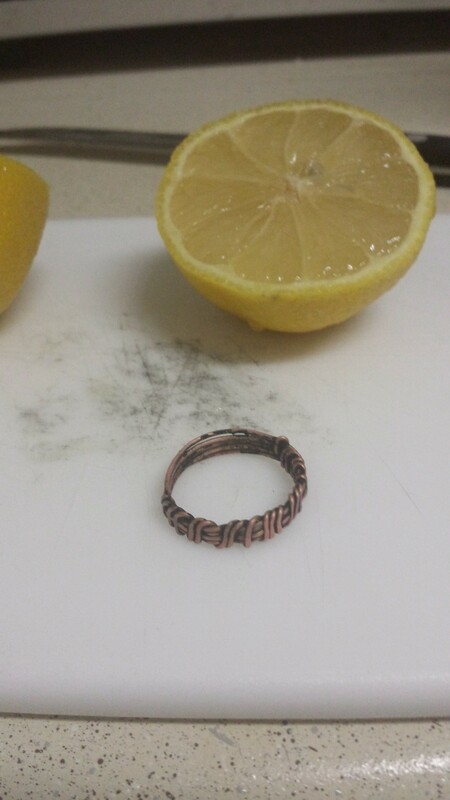 My partner’s ring got covered in black acrylic paint and other gunk the other day, so I took a few pictures while I cleaned it! 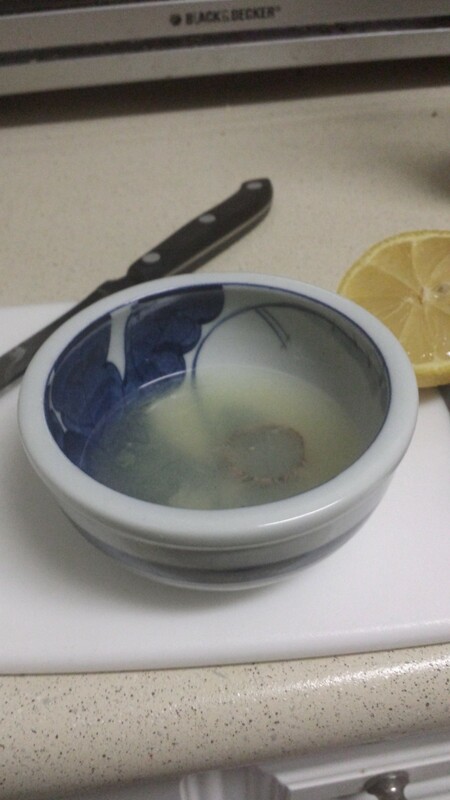 Juice 1/2 a lemon into a small bowl, and add 2 teaspoons of salt. You want just enough liquid in there to cover the piece you want to clean. 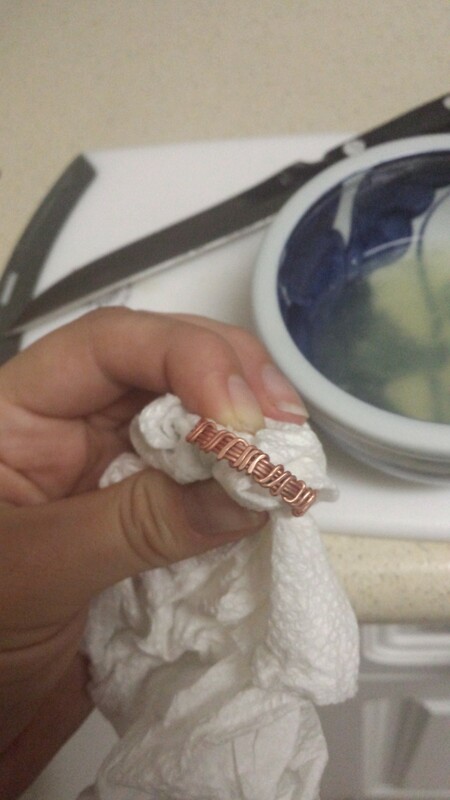 Place your copper jewelry into the bowl and gently swirl the mixture around. Make sure that the piece is covered. If it’s not, add a little more lemon juice and salt. Set your timer for about 5 to 10 minutes and let the piece sit. After 5 to 10 minutes has passed, remove the jewelry from the bowl and gently rub in with a paper towel. Most, if not all, of the patina and gunk should come off with minimal effort. Rinse the piece in running water and then dry it with a soft, lint free cloth. There are a few things to keep in mind before you clean your jewelry. Some stones like calcite can be harmed by acids and it would be best to keep them out of lemon juice. It’s also important to be patient when you’re cleaning wire wrapped jewelery. Small wires can get snagged on rags or bent out of place if they are scrubbed with too much force. Instead, use less pressure and trust the lemon juice and salt to do its job. 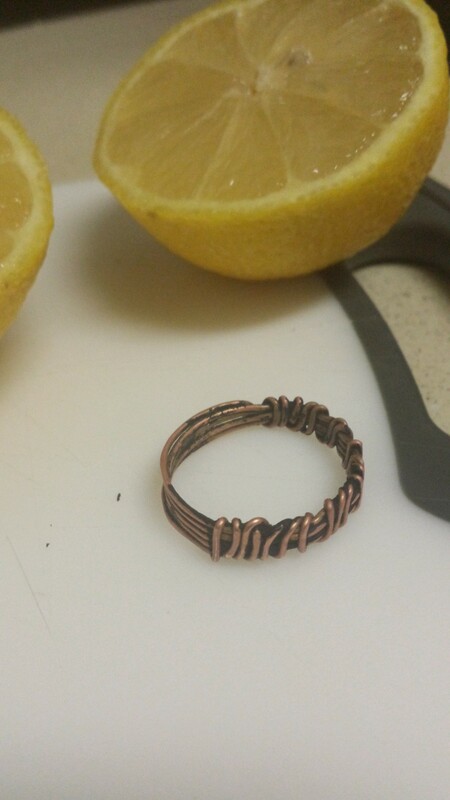 If you have any questions or other ideas on how to clean copper jewelry, leave me a comment!